These 80 degree days are throwing us all off, but in a few hours (lol) here in Michigan, we’ll be back to flannel shirts, scarfs, crisp leaves and pumpkin spice everything. As we approach winter and all the viruses and sickness that tends to accompany it, we wanted to share a few of our favorite ways to bolster the immune system and keep our insides as strong as our barbell-lifting outsides. A balanced immune system (one that doesn’t overreact as in the case of auto-immune disease and one that doesn’t underreact, making you catch every bug) is key to thriving this season. You may have heard they’re all the rage, and for good reason! Creating a syrup from the elderberries is an easy way to consume them. When taken regularly, it’s a potent preventative punch! You can buy elderberry syrup from stores like Apple Valley or Nature’s Market, can make it yourself or can buy it cost-effectively from our friend, Stacey, over at Nagelkirk Elderberry Syrup. If you’re in the Holland/Zeeland-area, click on that link to join her Facebook page and put your order in for her organic syrup (just water, organic elderberries and raw honey): 16 oz jar for $20. Stacey can deliver to the frig at Valeo for any fellow gym members who would like to order a jar! Our other secret weapon, and one with over 30 research studies on it, is called Juice Plus+. Actually *not* a liquid juice, but rather raw fruits, veggies and berries (including elderberry!) ground up and put into easy-peasy capsules and chewables. 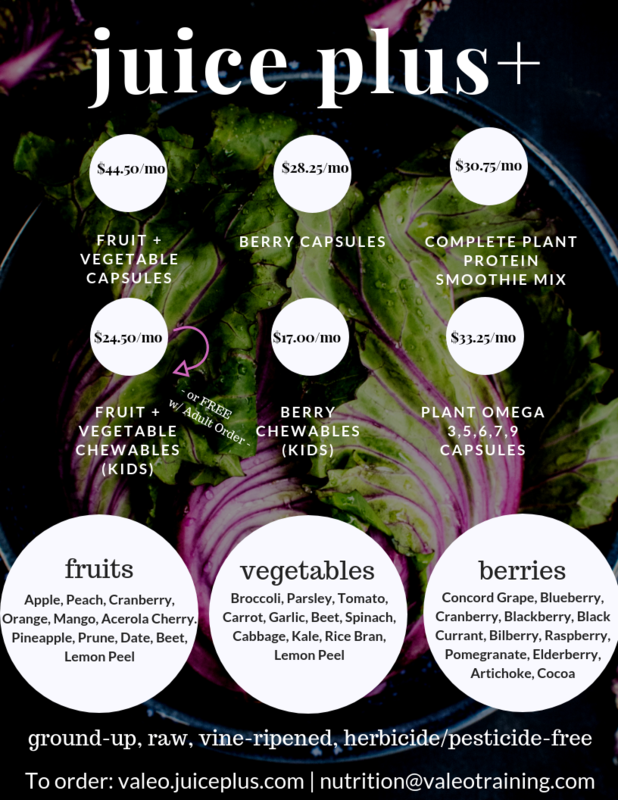 Since it’s really food, JP+ trumps multi-vitamins for being extremely bioavailable (aka they actually get into your cells and are used), and have been clinically shown, among other things, to balance the immune system, prevent damage from oxidative stress and lower inflammation. You knew fruits and veggies were good for you, but did you know they were THAT good?! It’s crucial to get 9-13 servings of a variety of colors every single day to combat the not-so-great things we may be eating or exposed to. This is why we love sharing veggie-full recipes like this Easy Cauliflower Soup and why we’ve also taken Juice Plus+ every day for the last ten years, year-round, no matter what. You can order Juice Plus+ by talking with your own Fruit + Veg Fairy or by emailing ours here at the gym at nutrition@valeotraining.com. Below are the package options and we’ll be happy to walk you through them to see what would be the best fit for you. Cheers to (more) Fruits! Vegetables! Berries! and other armor this season.